What’s In the Approved Fiscal Year 2019 Budget for Early Childhood Development? Implementation of 2016 Universal Paid Family Leave Act supported with $5.6 million in operating funds and $19.9M in capital funds for FY 2019. $10 million increase for child care subsidies, bringing them a little closer to the cost of care. 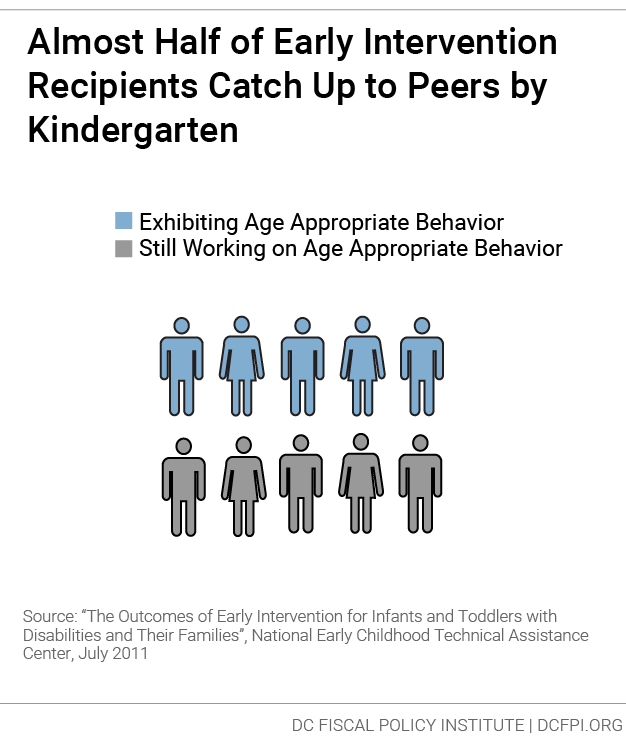 Fully funds early intervention expansion, so toddlers with milder delays benefit from services too. Low Income Investment Fund chosen to administer last year’s $9 million investment in facilities assistance, for child care providers to grow number of slots by 1,000. $2.5 million for child care tax credits for middle-income families. No additional funding for T.E.A.C.H scholarships to support early educators earning higher credentials. $1.3 million for key components of the recently enacted “Birth-To-Three” legislation that charts a path to comprehensive supports for early childhood. But much more is needed. The approved fiscal year (FY) 2019 budget includes some significant investments that will improve the quality of early care and education for low-income infants and toddlers in DC. This represents a great first step, but much more is needed to build a truly comprehensive support system for early childhood development in the District. Health and education are inextricably linked from birth to five years old. Good health care, strong family supports, and affordable quality early learning environments are all instrumental to the well-being of young children. The programs that are essential to the healthy development and early learning of children under five years old are spread across more than 10 District agencies and include over 40 programs. 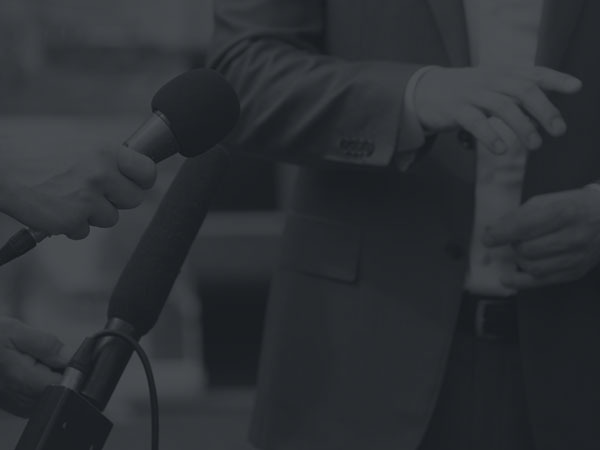 This report offers a partial picture of some of the most critical investments. The approved budget allocates the necessary funds to finally implement Paid Family Leave in DC, with tax collections starting next year and benefits slated to begin in 2020. The 2014 special education reforms are also fully funded, so more toddlers will benefit from early intervention services. 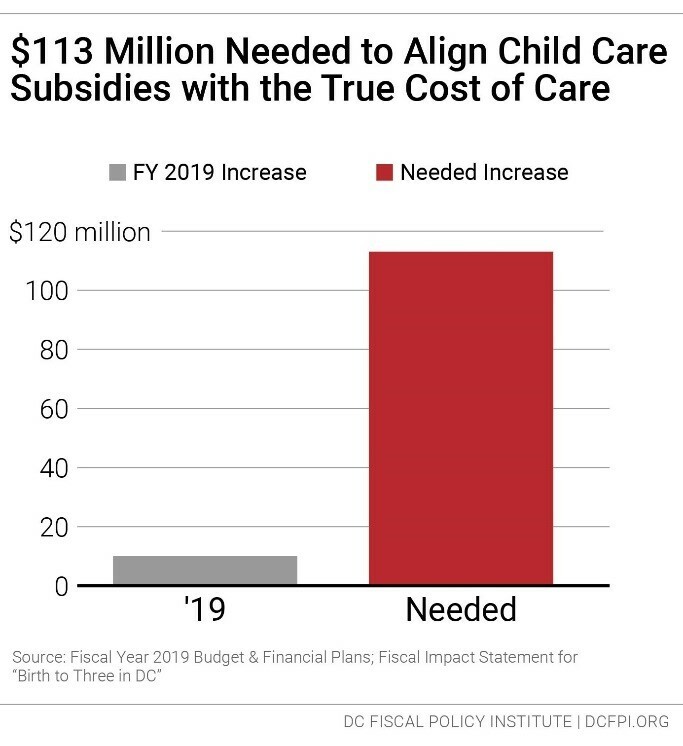 Critically, the budget also dedicates $10 million new local dollars to bring funding for the District’s child care subsidy program a little closer to the true cost of care, helping child care providers offer better learning environments for our youngest children (Figure 1). The recently enacted “Birth to Three For All DC” legislation takes a comprehensive approach to improving the quality and affordability of early childhood education. The legislation expands and fully funds DC’s child care subsidy program, raises compensation for early educators, and improves access to health services and supports for families. The 2019 budget commits $1.3 million to seed key components of this legislation, including more money for home visiting programs. But fully implementing these important reforms will take many years and much more money. The Mayor and DC Council should make the full funding of this legislation a top priority in the years to come, for the benefit of DC’s youngest children, their families, and the future of our city. A strong foundation for early childhood development and early learning begins before birth. Families will see tremendous gains in economic security and public health from having paid leave to care for themselves or a new child. Paid family leave also reduces infant mortality, which remains high in Wards 5, 7, and 8. The approved budget provides $5.6 million in FY 2019 operating funds for paid family leave implementation and $40 million in capital costs through 2023, with $19.9 million in funding for FY 2019. This funding will allow the paid leave program to move forward – eventually it will be self-funded through a payroll tax. Benefits from the program will allow private sector workers to be compensated for lost wages when taking time off to care for a new child. For more on the District’s other workforce supports, see DCFPI’s Employment and Training Toolkit. The budget expands our local investment in the District’s home visiting programs, increasing funding by $700,000. DC’s home visiting budget also includes $1.5 million in federal grant funds through the Maternal, Infant, and Early Childhood Home Visiting program (MIECHV), a federal program that supports evidence-based home visiting programs across the United States. A $60,000 Innovation Grant through MIECHV will support training for best practices in home visiting. Home visiting is a proven family support strategy to help pregnant women, children under five years old, and their families achieve the best possible outcomes in maternal and child health, and development. Currently, Department of Health home visiting programs primarily target families of children aged 0 to 3 in Wards 5, 7, and 8 and homeless families. Existing home visiting services do not reach all of the families who could most benefit from them, and the District’s local investment in home visiting is too low to adequately support the programs and their workforce. To attract and retain a broadly skilled home visiting workforce capable of meeting the need for services, there must be an adequate and sustained investment in home visiting. Yet the District devotes relatively few local dollars to support the program compared to other jurisdictions. In FY 2018, the District is spending less than $2 million local dollars on DOH-based home visiting programs. For more on the District’s public health programs for FY 2019, see DCFPI’s Health Care Toolkit. Currently, the District supports the education of about 5,100 infants and toddlers through the Child Care Subsidy/Voucher program, administered by the Office of the State Superintendent of Education (OSSE). The program reimburses child care providers for the costs of educating low-income children. The approved FY 2019 budget includes a substantial increase of $10 million for educators serving low-income infants and toddlers (see Figure 1). This builds on much-needed investments in early education from last year’s budget, including new dollars for the child care subsidy program, and an investment in supplemental ‘at-risk’ funding for low-income three- and four-year-olds enrolled in public Pre-Kindergarten in community-based settings. Although the District has made great strides in improving the education of three- and four-year-olds, much more is needed to support the education of children under three. OSSE’s 2016 report “Modeling the Cost of Child Care in the District of Columbia” finds that subsidy rates are insufficient to meet the cost of providing the quality of care and education our youngest residents need, and particularly so for the providers offering the highest quality care. This leaves many providers struggling to make ends meet and contributes to a shortage of high-quality care (Figure 2). Teachers and staff earn far less than they deserve, and low-income families often cannot secure continuous, high-quality education for their young children. This is particularly a problem for providers in low-income neighborhoods that primarily or exclusively serve children who are in the subsidy program, because they are taking a loss on each child they educate. Essentially all licensed infant and toddler slots in Wards 7 and 8 are used by children receiving subsidies, and over half of the children in licensed child care settings in Wards 1, 4, and 5 are receiving subsidies. The number of licensed educational options for children with subsidies downtown in Wards 2, 3, and 6 is substantially lower. Quality early education is a smart investment in the future success of young children, and particularly so for low-income infants and toddlers. Access to high-quality, affordable early learning can reduce the difference in school readiness between low-income toddlers and their higher-income peers, which begins even before three years old. Children who receive quality care also grow up to earn more money as adults. The $10 million new local dollars for the child care subsidy program will improve the quality of education for the estimated 5,100 infants and toddlers who currently participate, and it also will support improved working conditions of the adults who care for them. But this is only the first step of many to build a truly comprehensive support system for early childhood learning in the District. The approved FY 2019 budget also funds three critical special education reforms that align services with best practices, including expanded eligibility for toddlers who need early intervention services. These reforms have been on hold since 2014 due to lack of funding. Although there are no new funds explicitly identified in OSSE’s budget for the early intervention expansion, the “subject to appropriations” language has been lifted and the money needed to fund the reform has been incorporated into OSSE’s financial plan. Updated eligibility data and offsets from Medicaid payments resulted in a much lower fiscal impact than first estimated. OSSE now estimates that 180 children will be eligible monthly, at a cost of $865 per child. Birth to age three is a crucial time for brain and body growth. Yet too many babies and toddlers fall behind because they have unaddressed developmental delays in areas like language or motor skills, especially low-income children. Almost half of children who get early intervention services completely catch up to their peers behaviorally by kindergarten (Figure 3). Starting this July, more toddlers with developmental delays will get back on track. Identifying and investing in extra supports for students with developmental delays at earlier ages improves long-term academic trajectories and reduces the need for more costly special education services down the line. Currently, by high school, fewer than one in 10 special education students are college and career ready. For more on the special education reforms that benefit older students, see DCFPI’s PreK-12 Education Toolkit. In the FY 2018 final budget, Mayor Bowser allocated one-time facilities assistance money to help child development centers grow by 1,000 seats over three years. The Low Income Investment Fund was selected by OSSE in February to administer these grants ($9 million). The District also commissioned a Supply and Demand study that is near completion. This study will help inform the locations of these expansions as well as other pending legislation on child care supply-building initiatives. The budget includes a one-year refundable tax credit for child care expenses for kids up to three years old attending a licensed facility, up to a $1,000 maximum per child, at an estimated cost of $2.5 million. Families receiving childcare subsidy will not be eligible. Although families with incomes up to $750,000 will be eligible for the credit, it is expected that only 2,500 families will use it. Many families struggle to manage the steep costs of early care and education. In 2017, center-based early care and education in the District averaged $23,000 a year. Although this new child care tax credit will offset a small portion of that cost, it is not targeted at families who need it the most and is unlikely to inspire or enable families to switch to a higher quality provider. Unlike tax credits, child care subsidies are highly targeted and connected to measures of continuous quality. 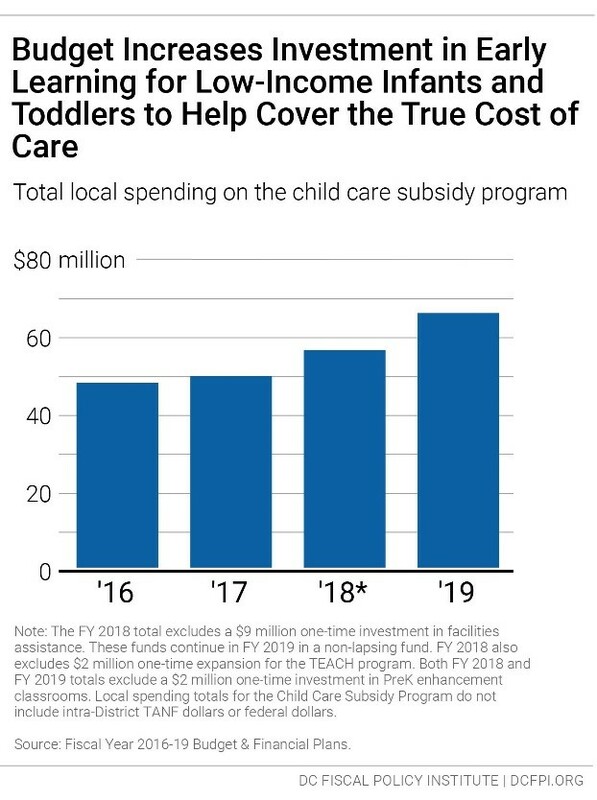 Investing in the child care subsidy program drives the most resources to the highest quality care to the benefit of the children with the biggest barriers. We ought to be investing much more to make quality early education affordable for all families, but the dollars should go first to improving the quality of care for the children and families who need it most. As part of an ongoing effort to improve the quality of early education in the District, OSSE recently increased the minimum education requirements of the early childhood workforce. The Teacher Education and Compensation Helps (T.E.A.C.H) grant covers a large share of the costs of tuition, books, and paid release time, as well as a travel stipend and a bonus for early educators earning an associates or bachelor’s degree in early childhood education. There were no new dollars allocated to T.E.A.C.H scholarships in FY 2019. Early childhood educators deserve a salary that reflects the value they add to our city and raises in accordance with their qualifications and experience. Yet the professionals we rely on to lay the educational foundation for our children and future workforce are among the lowest paid, earning $29,450 on average and rarely receiving health or retirement benefits. Inadequate compensation often leads to high turnover, which interrupts the continuity of care for young children. Without better compensation and benefits, teachers may leave community-based organizations for DC Public Schools or leave the field entirely. Underinvestment in early childhood educators intensifies DC’s deep racial and economic inequality. Low wages in this important sector contribute to both gender and racial disparities in earnings, as the District’s early educators are largely women of color who must support their own families on meager wages. Without deliberate policy strategies to raise compensation and benefits, teachers are likely to leave the field to earn more with a higher degree in other industries. The District needs to secure a qualified, professional workforce to educate the growing number of young children in the District. We need to both support current educators in attaining those credentials and ensure that their salaries ultimately reflect the investment of time, energy, and money the new regulations demand. The recently passed “Birth to Three For All DC” includes deliberate policy strategies to address this, including development of a salary scale to compensate early educators on par with their DCPS peers. The funding needed to develop this salary scale was provided in the FY 2019 budget. The partial funding of “Birth to Three for All DC” also expands access to on-site classes for early educators pursuing higher degrees. The DC Council recently took groundbreaking steps to invest more in early childhood development, with the adoption of “Birth to Three For All DC” legislation last month. The comprehensive approach of the “Birth to Three” legislation builds on the success of DC’s universal pre-K3 and pre-K4 expansion over the past decade, by focusing on better serving our infants and toddlers before they get to pre-school. The legislation calls for fully funding DC’s child care subsidy program, raising compensation for early educators through a competitive salary scale, and improving access to health services and supports for families. home visiting services, and on-site classes for early educators earning higher credentials (Table 1). For more on “Birth to Three For All DC,” see DCFPI’s blog. Every child deserves a strong start and a high-quality education, beginning at birth. The District has made important investments towards this end, but still falls far short of meeting the need, particularly for our youngest children in low-income families. Underinvestment in early childhood education contributes to DC’s serious racial and economic inequities. “Birth to Three For All DC” can serve as a powerful guide for how the District can take a more comprehensive and equitable approach to investments in early childhood education. The cost of the “Birth to Three in DC” legislation scales up over time to the sizeable investment the District needs to serve families with young children. Fully implementing these important reforms will take many years and much more money. It is imperative that the District raise the revenue needed to fully fund this comprehensive vision in the years to come. These investments will not only benefit our youngest learners and the adults who care for them — they will also strengthen our entire city. “Birth to Three For All DC” improves school readiness for children and strengthens supports for early childhood educators. This legislation identifies the true cost of high-quality early education for infants and toddlers in the subsidy program, and ensures child care subsidy payments rise to cover those costs over the next few years. 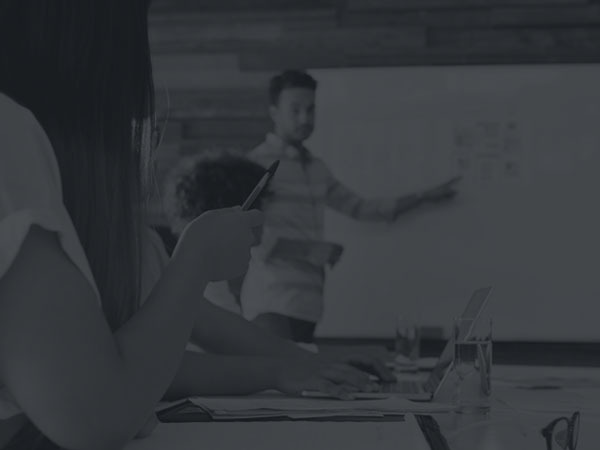 It implements a fair, competitive teacher salary, and expands options for early childhood educators looking to improve their credentials to meet the upcoming, higher new standards. The legislation prioritizes improving early education for the children with the greatest needs, by expanding the Quality Improvement Network to ensure that the education of children in low-income families meets the highest quality standards (as set in the Early Head Start program) in Ward 7 and 8 by 2023, and citywide by 2025. “Birth to Three For All DC” advances healthy child development. Mental health, physical health and nutritional health supports are as important to early learning for infants and toddlers as classroom activities. The legislation expands evidence-based programs that provide behavioral and mental health care consultation services, like Healthy Futures, to all child development centers. The Birth to Three legislation also invests local funds to expand and sustain the Healthy Steps model, which connects families with wrap-around services during pediatric visits. It establishes a Lactation Certification Preparatory Program to provide instruction, assistance, and mentorship to individuals pursuing a career in lactation consulting. “Birth to Three For All DC” supports parents and families. Many families need help understanding and supporting their child’s development and may not know how to find the resources they need, never mind pay for them. This legislation improves and expands home visiting programs, a proven strategy to help connect families to essential supports, promote improved health care utilization, and support healthy child development. It invests in Help Me Grow, a phone-based , care coordination system to help families navigate the District’s support services, and maintain centralized records of developmental screenings and data. Finally, it makes child care more affordable for all families, and does so in a progressive way, by setting child care co-payments for all parents that rise with one’s income, such that no family spends more than 10 percent of their income on child care. The comprehensive approach laid out in this legislation is laudable and it underscores that DC’s leaders are ready to invest more in the healthy development of our youngest children. Far more funding will be needed to implement the comprehensive vision of this bill, rising to about $500 million ten years from now. This is a substantial amount, but the District has shown before that it can make these kinds of important investments in children. We can look to the successful implementation of universal pre-K as a powerful example of what’s possible. Agencies include: the Office of the State Superintendent of Education, DC Public Schools, DC Public Charter Schools, Department of Employment Services, Department of Public Libraries, Department of Parks and Recreation, District Department of the Environment, Child and Family Services Agency, Department of Health, Department of Behavioral Health, and Department of Health Care Finance. Both DCPS schools and public charter schools receive an additional $2,334 per student for low-income students and other students at-risk of falling behind academically. ‘At-risk’ funds are designed to promote equity: to ensure that low-income students get the same kinds of enriching opportunities and services as their higher-income peers, and to ensure that students who are struggling academically get the targeted supports they need to succeed in the classroom. They are supposed to help schools provide supplemental resources and expand important services for the students who need them most. 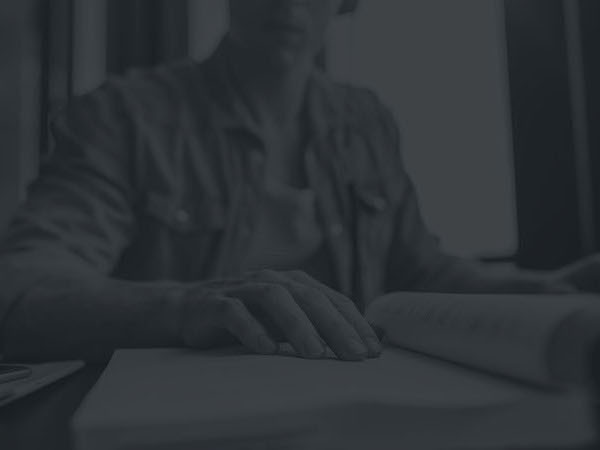 Out of 1,171 students with disabilities who graduated in 2016, only 386 were employed, participating in college, or enrolled in another postsecondary degree program one year after graduation. Office of the State Superintendent of Education. (2018). Question 46, Fiscal Year 2018 Performance Oversight Hearing Responses. Retrieved from the Committee on Education 2018 Dropbox.